The contest between The Wallabies and The Springboks is one of the major rivalries in rugby union. 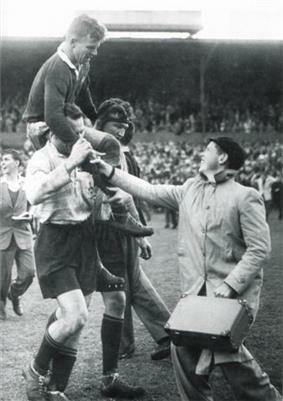 The teams' first meeting was on 8 July 1933 at Newlands in Cape Town in the first of 5 tests on the 1933 Wallabies tour. The test was won 17-3 by South Africa who also won that first series 3-2. South Africa has a better than 57% winning record against Australia, and before the era of sporting boycotts, dominated the early encounters up to 1971.Out of all their tests, South Africa holds the advantage having won 45 of the 81 games between the 2. However, since South African rugby's readmission in 1992, the head-to-head record is quite even, with Australia holding a very slight edge, having won 28 out of the 52, and of which South Africa winning 24, and only 1 draw. Both sides have exhibited a considerable home advantage, with the Springboks winning more than 75% of matches played in South Africa, and the Wallabies winning more than 60% of matches played in Australia. In the amateur era, the Springboks made five tours to Australia, and were undefeated in three of them. South Africa won two of the four test series they played in Australia; 2-0 in 1937, and 3-0 in 1971. By contrast, the Wallabies made six tours to South Africa, only once making it through undefeated, albeit on a tour comprising only four matches and one test in 1992. Prior to that, Australia's best away tour was the 2-all drawn test series of 1963. Prior to 1972, South African teams were racially selected, organised by the whites-only South African Rugby Board. Australia then supported the international boycott of sporting contacts with South Africa over the issue of apartheid. The teams did not meet again until 1992, when apartheid was being dismantled and the SARB had merged with the non-racial South African Rugby Union. Since that time Australia has won almost 60% of their games and enjoyed much success in South Africa, winning the Mandela Plate nine times in the twelve years since its inception. In the professional era, extended tours of each country have been replaced by participation in an annual series involving the top teams of the Southern Hemisphere. From 1996 through 2011, Australia and South Africa competed alongside New Zealand in the Tri Nations series. Starting in 2012, the three nations will compete alongside Argentina in The Rugby Championship. In the Tri Nations era, the Wallabies and Springboks played two or three encounters each year on a home-and-away basis; the Rugby Championship will feature two annual encounters, also on a home-and-away basis. Australia and South Africa have met three times in the Rugby World Cup. In 1995 they were drawn in the same pool and host nation South Africa won 27-18, going on to win the cup. In 1999 Australia knocked South Africa out of the competition in a semi-final at Twickenham, winning 27-21. In 2011, Australia again knocked South Africa out of the competition, in a quarter-final at Westpac Stadium in Wellington, winning 11-9. Below is a list of matches that Australia has awarded matches test match status by virtue of awarding caps, but South Africa did not award caps. 2 July 1921 University Oval, Sydney 9 – 28 South Africa Not classed as a full international by South Africa who fielded an South Africa XV. 27 June 1921 Royal Agricultural Showground, Sydney 11 – 16 South Africa Not classed as a full international by South Africa who fielded an South Africa XV. 25 June 1921 Royal Agricultural Showground, Sydney 10 – 25 South Africa Not classed as a full international by South Africa who fielded an South Africa XV. ^ "ESPNscrum Team Records". espnscrum.com. Retrieved 26 November 2013. ^ a b Pick and Go rugby archive - select Wallabies and Boks.